Vend’s Top 50 Retail Influencers for 2017. Vend is back with our highly anticipated Top 50 Retail Influencers list. The 2017 edition puts established influencers alongside new faces — and like last year’s roundup, it features the industry’s most authoritative analysts, reporters, researchers, and consultants. Check them out below! The National Retail Federation is the world’s largest retail trade association, representing all retail formats for America’s largest private sector employer. Bob Phibbs, aka the Retail Doctor. Professional speaker on retail sales, training, and marketing. Author, blogger, business makeover specialist, Harrier hound lover. Retail Tech Guru; Top Wall Street Retail, Retail Tech, and Drugstore/PBM Analyst. Expertise: Emerging Retail Technolgies, Fashion, and Real Estate Trends. Speaker, author of The #Retail Revival, and global advisor on the #FutureOfRetail. Syndicated columnist for CBC Radio. Co-host of The Future In Store. Founder of Portas Agency and Mary’s Living & Giving charity shops, broadcaster, retail expert, author of Shop Girl, and highstreet campaigner. Chief Retail Strategist at Shoptalk. Former retail analyst at Forrester Research. Managing Director of GlobalData Retail and founder of Conlumino where we analyse all sorts of things to do with retail and consumers. Font fanatic and campaigner against Comic Sans. Group Research Director at GlobalData Retail. Retail analyst: UK, global, all views expressed are my own. Pres SW Retail Advisors, angel investor, CNBC Analyst, Found key break free Sell Side, polo player, int store hunter, perma jet- lag, top 20 retail influencer. Retail analyst / commentator / author. Tweeting about future retail trends and changing shopping habits. He’s Kizer. She’s Bender. We’re consumer anthropologists, speakers, authors, consultants and all about retail. We’re married... just not to each other! Twittering Head of Global Technology Practice at Planet Retail & Publisher of Retail Technology magazine. #Retail & Measurement Consultant. Founder IMS Retail University. Owner IMS Results Count. Top 15 Retail Influencer / Top 25 Retail Website / Global Visionary Connector of Ideas & People for Profitable Business Growth / Views and content are my own. Just the guy who’s helped thousands of retailers sell more stuff through their staff. 25 years on stage and now online everywhere. A retail pundit with an insatiable passion for the industry. Chief Problem Solver, Speaker, Collaborator, Professor. Beware-her enthusiasm is contagious! Head of Research at Kantar Retail - a global retail research and consulting firm. Retail analyst | Founder @RetailReflect & The Retail Advisory Board | #25 UK retail influencer | Advisory Board @4SwiftShift | Futurist @IBM | Views my own. Professional speaker, author, retail business coach & consultant. I work alongside retailers in bringing their businesses back to life!! Insights Director at TCC Global. Personal Tweets about retail, burgers & football. Retail, tech & marketing consultant. Led store & e-commerce businesses @Nordstrom @solesociety @hudsonsbay @lordandtaylor @NineWest. Now: start-ups + writing. Forward-thinking insights on retail, ecommerce, online grocery, CPG, and FMCG. SVP, Strategy @Profitero. Previously VP, Advisory @Retailnetgroup. Editor In Chief at Innovative Retail Technologies. Retail speaker, thought leader & strategist to global suppliers, brand marketers, solution providers & agencies. Future-proofing retail positioning since 2000. Senior writer @FortuneMagazine covering retail and consumer goods. Reuters alum. Obsessed with 26.2, Def Leppard, Muppets, Looney Tunes, Canadiens. Editor of @EssRetail. Business, technology, @rbtexpo, LFC, travels, running, Kent. Predominantly retail news, but this is a personal Twitter account. Managing director of Retail Week. Always on the side of retail. Posts are all my own views, so also expect ramblings on music, media and sport. Head of Trends at Insider Trends. I help large retailers innovate and create world-leading, profitable retail concepts. Content Strategist for G3 Communications; Retail TouchPoints; Content4Demand; Demand Gen Report; music junkie and fashion/beauty lover. Retail business journalist with 20 years’ experience, available for freelance editorial projects. Editor of the popular retail news portal Retail Times. Leader at MPC, a custom B2B marketing content firm. Sr. Exec. Editor at Innovative Retail Technologies magazine. How did we create the 2017 Retail Influencers list? To come up with this year’s list, we scoured the web, sought out nominations from the retail community, and used social influencer tools such as BuzzSumo and Klear to identify retail experts. But we didn’t stop there: we also took a closer look at each nominee to determine just how influential he or she really is. We read their articles, listened to their commentaries, and looked into their contributions to the retail industry, and then we used all these factors to determine their placements on our list. The people on this list are the experts who retailers turn to for advice, news, and best practices. They’re constantly sharing insightful content and commentary about the retail industry and actively helping merchants improve their stores. How you can be part of the list? Retail-centricity is important — so if you want to be part of our list, you need to live and breathe retail. Insightful content is another determining factor, so we’ll be looking for published articles, interviews, reports, and speeches. It’s also a plus to have strong media and social presences. If you’d like to be included in next year’s list or if you’re looking to nominate another expert, please leave a comment below to let us know. Gain influencer-backed insights into the future of retail. Can’t get enough of influencer content? Check out Vend’s guide to the future of shopping. 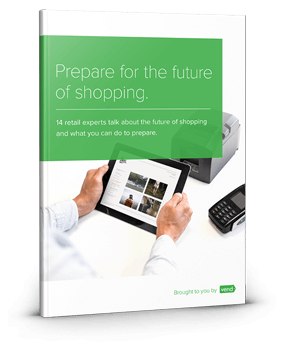 Featuring insights and predictions from 14 retail experts, this resource gives you a look at what’s in store for the retail industry and sheds light on what you should do to prepare. Download it for free today!